Dooring Locations in Downtown Toronto 2014-2016. Dooring locations denoted with a yellow dot. Blue lines indicate the presence of bicycle lanes. Hot spots in red. UPDATE: Councillor Jaye Robinson, Chair of the Public Works & Infrastructure Committee, has said that dooring collisions are included in the 10 Year Cycling Network Plan (CNP) approved by Toronto City Council in 2016. The CNP was subsequently included in the Road Safety Plan. However, City staff noted that they excluded major streets with streetcar tracks and on-street parking from their 2016 analysis. These streets pose a significant risk to cyclists in Toronto. Protected bike lanes are a key way to reduce dooring collisions. More work must be done to reduce these dangerous collisions in Toronto. Based on analysis of dooring collisions provided by the Toronto Police Service, the number of collisions involving cyclists in Toronto is on the rise. A dooring collision happens when someone in a motor vehicle strikes a cyclist by opening their car door into traffic. The number of dooring collisions reported to the police increased year over year in both 2015 and 2016 and was up 58% in 2016 from the 2014 baseline. Streets with streetcar tracks and on street parking are overrepresented in the data, with particular emphasis on Queen St W and College St. This suggests that existing infrastructure does not adequately protect people travelling by bike in locations with on-street parking and streetcar tracks. Streets without streetcar tracks that posed a hazard to cyclists include Bloor St W and Yonge St. Particularly dangerous intersections include Yonge & Dundas and Yonge & Bloor. These destination-rich locations attract many people travelling by bicycle yet represent serious hazards because of the absence of cycling infrastructure and a high number of motor vehicles engaged in pick-up and drop-off activities. As shown on the map above in blue, streets with bike lanes had lower rates of dooring collisions than streets without them. The dooring rates on streets with protected bike lanes, such as on Richmond & Adelaide, were even lower. Disturbingly, dooring collisions were not included in the Road Safety Plan approved by Toronto City Council last year. They also weren’t included in the 1,070 cyclist collisions reported by the Toronto Police Service for 2016. 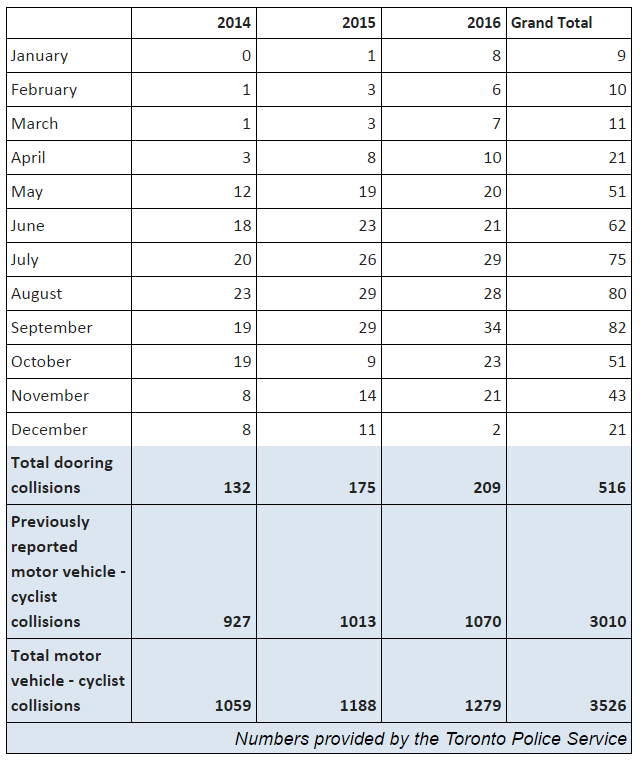 Including 2016 dooring collisions brings last year’s total cyclist collisions up to 1,279, and that’s only the number of those that were reported. Due to a change in the Motor Vehicle Accident Report (MVAR) instituted at the Provincial level, dooring collisions were removed in 2011. It was determined at that a driver opening their car door into the path of a cyclist while parked did not constitute a vehicle in “motion” as defined by the Ministry of Transportation. This has resulted in doorings not being a reportable collision and thus is not found in collision databases. In 2013, the Toronto Police Services Board directed staff to report back on protocol used to track dooring collisions. Staff reported back that they relied on incident reports to track dooring collisions. These incident reports have been inconsistently used as they are not a part of normal collision reporting protocol. Bicycle advocates have attempted to fill the gap with self-reporting tools like doored.ca but to truly tackle the problem we need policy change from the Province and from the City. The fine for dooring a cyclist was increased to $365 plus three demerit points in 2015. The numbers outlined below should be considered minimums since they only account for doorings that were reported to the police. Cycle Toronto has compiled a set of recommendations to reduce the number of dooring collisions in the City. Use your right hand when opening your car door. Always shoulder check before opening your door.